I have two of these L.A. Colors Flash Pop! polishes (see the haul here) and love them for two reasons; they're super cheap, and they make deciding what glitter to team with your base colour that much easier. Obviously you can just use the pink, or just use the glitter, the beauty is that the choice is there! This is in the shade Pinksicle and as you can see it is a light baby pink shade on one side and pink holographic glitter on the other. I only needed one coat of the pink for it to be opaque and used two coats of glitter on my thumb, middle and little finger and love the effect. You can find these on Cherry Culture for only USD $1.49, Beauty Joint for USD $2.25 and you can buy these at The Warehouse here in NZ for only $5.00 - a total bargain! 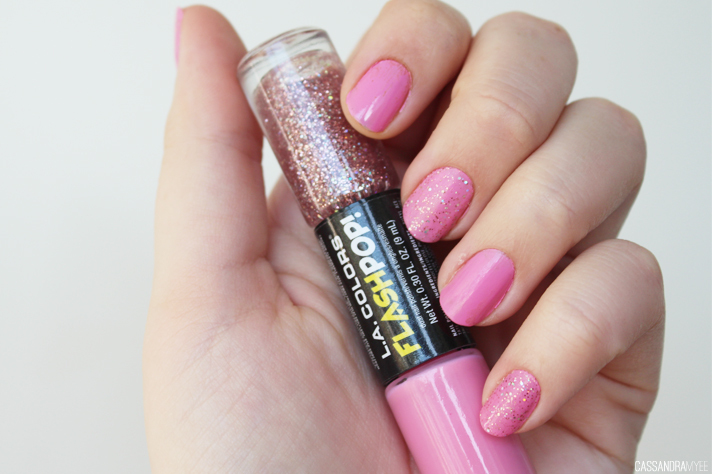 Have you used this brand of nail polish before?